ETrade announced that the ETrade Super Bowl 2012 Ad will again feature the talking baby. 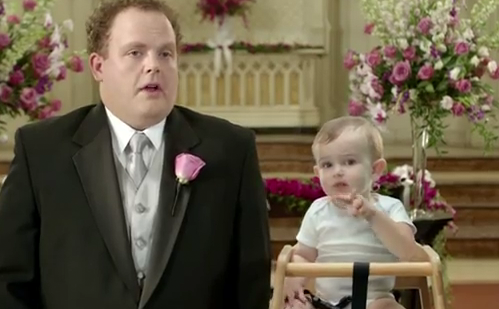 This marks the fifth year that the talking baby will appear in an ETrade Super Bowl commercial. The new Etrade Baby ad is part of an integrated multi-channel campaign that highlights the full range of products and services ETrade offers to help investors plan their financial future, available both online at etrade.com and through the firm's growing network of financial consultants and retail branches. The official ETrade Super Bowl 2012 Ad titled Fatherhood is online. Watch Now! "We're thrilled to announce the E*TRADE Baby is back to make his fifth consecutive appearance in the big game," said Nick Utton, Chief Marketing Officer at E*TRADE. "The Baby has become an iconic brand ambassador that has enabled us to capture the imaginations of investors and effectively showcase the benefits of our investment solutions in a memorable and entertaining way." The Super Bowl spot, one of a series of new ads planned for 2012, features the ETrade Baby interacting with people facing special life events that trigger a need to consider financial planning. ETrade has already published a new talking baby ad. It is not clear if this will be the one for the Super Bowl 2012. You can watch the new baby ad below. "As E*TRADE continues to evolve its strategy and service offering beyond trading to serve investors' full range of financial needs both near- and long-term, so too has our marketing strategy," said Mr. Utton. "Our evolved approach keeps our campaign fresh and engaging by featuring meaningful life events that people can easily relate to, and providing a unique Baby perspective on the E*TRADE investing solutions available to help them." Etrade will publish a new video with the Top 10 Baby Moments. In the announcement ETrade says this is a viral video. I always find qualifying a video as viral before it is presumptuous. Maybe the video fails to grab attention and it will not be shared. Will see about that. The Volkswagen teaser video for the VW Super Bowl 2012 Ad did indeed go viral in a big way. ETrade also plans to offer real-time updates from the ETrade Baby on Facebook and Twitter. The ETrade BabyMail app is still available on Facebook. In addition to the new Super Bowl spot, ETrade will launch a new series of Investing Solutions television spots in February, showcasing products, people and tools in a unique demo format that presents a compelling case for choosing ETrade.